Efficient Communications operates on the principle that the most productive healthcare teams have no barriers to communication, allowing schedulers to store contact information and reach out to their physicians and nurses as quickly as they need to. They can choose from various methods of contact, so whether it’s a routine need or an emergency, schedulers will spend little to no extra time locating their team members. departments easier than ever before. Communicate quickly with staff when and how you need to by notifying users of open shifts – advanced rule logic makes locating any available staff easier than ever. Make important announcements in the bulletin board, or display them based on work times. Secure texting and paging system integrations allow for an even more efficient and seamless communications experience. With shift reminders and department announcements delivered to physicians, advanced practitioners, and nurses through the native mobile app, everyone is always aware of important work details, so miscommunication doesn’t occur and lead to understaffing. 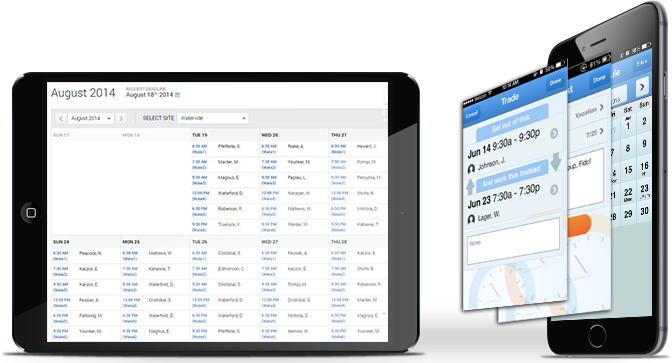 If it would work best for your organization to have the schedule integrated with the paging system, that’s easily done with Efficient Communications. Eliminate the need to enter schedule data into a separate system, and easily page anyone on staff with the up-to-date schedule when necessary.